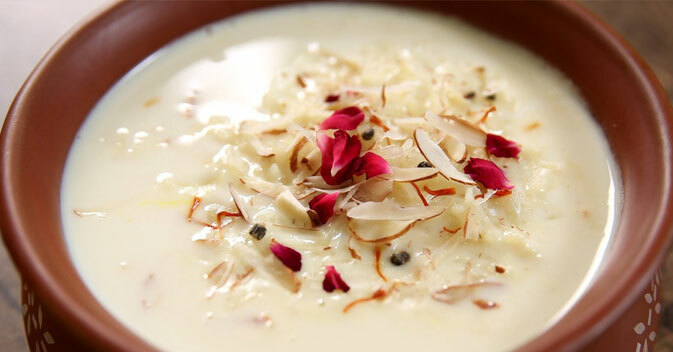 Our mouth waters and eyes dazzle as soon as we hear the word kheer! The whole of north India knows kheer as much as it is prepared every now and then. Known as 'payesh' in Bengal, 'payasam' in South India and 'kheer' in Orissa, it is an Indian recipe as well as a Pakistani traditional dish. In English it is the common rice pudding! Indeed, this yummy sweet dish is the favorite Indian home recipe. For children and grownups, there need not be any occasion to enjoy the milky preparation. Ideally, kheer is made from rice. But sometimes, vermicelli is also used to make kheer. Both are 'kheer' and prepared with condensed milk. On the festive occasion of Raksha Bandhan, sisters should step forward to give a happy delight to their brothers with the ultimate sweet satisfaction dish called kheer. So, let us together find out the process and method of preparing kheer at home at sendrakhi.com. In a considerably big pan, mix the boiled rice, fresh milk and biscuits and bring it to a boil. Simmer the flame and let it boil for sometime, for say about ten minutes. Allow the milk to get thick. Now, mash the rice and biscuits in the milk and mix well. After sometime add dry fruits and cream to it and again let it boil for sometime. After a couple of minutes, remove the kheer from the flame. Add the vanilla essence to the kheer and it is ready to be served. On the other hand, if you are using vermicelli for making the kheer, you take milk in a pan and pour the vermicelli into it. Allow the vermicelli to get properly cooked and thicken in milk for quite sometime for say about 30-45 minutes. Then add crushed cardamom to it. You can also add dry fruits to it too. Tip: You can also serve chilled kheer, both the rice or vermicelli kheer.